The Interventional Management of Stroke (IMS) I trial suggested that the combined use of reduced-dose intravenous (IV) Activase (alteplase, recombinant tissue plasminogen activator [rtPA]; Genetech, South San Francisco, Calif), followed by microcatheter-delivered intra-arterial (IA) rtPA, was relatively safe and may be clinically useful in selected patients with acute ischemic stroke, as compared with similar subjects treated with a full dose of IV rtPA in the National Institute of Neurologic Disease and Stroke (NINDS) rtPA trial.1 It had long been anticipated that multiple interventional methods might be applicable within an IV/IA rtPA paradigm and that these methods might further improve revascularization and clinical outcomes.2 Encouraged by the safety and potential efficacy reports in a small feasibility trial of the MicroLysUS Sonography Catheter (EKOS Corp, Bothell, Wash) (hereafter referred to as the sonography microcatheter), the IMS Investigators initiated another phase II trial (IMS II) to further study its use following reduced-dose IV rtPA therapy.3 This article reports in detail the revascularization, clinical, and safety outcomes in the IMS II trial, with emphasis on results obtained with the Primo sonography microcatheter (EKOS Corp), including general as well as detailed comparisons with revascularization outcomes from IMS I.
Revascularization was measured according to recanalization of the primary arterial occlusive lesion (AOL), and reperfusion was measured by a modified Thrombolysis in Cerebral Infarction (TICI) score.5,6 AOL recanalization and the modified TICI perfusion were scored as grades 0–3 (Table 1). The protocol primary study revascularization end point was 100% complete recanalization of the primary occlusion at (AOL 3) at 60 minutes, compared with complete standard microcatheter thrombolysis at 60 minutes in the IMS I trial. Secondary revascularization measures included both AOL 3 recanalization and TICI 2/3 reperfusion at 120 minutes or at the end of the procedure, compared with 60 comparable occlusions (internal carotid terminus [ICA T], M1, M2, vertebrobasilar) in the IMS I trial. In addition, any recanalization of the AOL by using a sonography microcatheter at each sequential 15-minute interval was recorded and compared with standard microcatheter recanalization at each sequential 15-minute interval from IMS I subjects with comparable occlusions as well as with standard microcatheter use in comparable IMS II occlusions. The revascularization study end points were determined at the Clinical Coordinating Center at the University of Cincinnati by a central reader (T.T.). Operators were asked to ascribe Thrombolysis in Myocardial Infarction (TIMI) recanalization scores for their procedures, as had been recorded in IMS I. Operators’ scores were compared with the scores of the central core lab. The clinical efficacy measure of modified Rankin Scale (mRS) score 0–2 outcome at 3 months and mortality were also recorded, and both these measures were further analyzed according to revascularization status. Revascularization end points were also compared with mRS score 0–2 outcome and mortality from the IMS I study. Finally, recanalization and reperfusion data from the sonography and standard microcatheter groups from IMS II and IMS I were pooled to estimate good outcome and mortality results that might be achieved with ICA T and M1 occlusions with the IV/IA rtPA paradigm. As a primary safety measure, CT scans within the first 36 hours after completion of rtPA infusion were monitored for intracerebral hemorrhage (ICH) and contrast deposition, including contrast extravasation (CT attenuation >90 HU, hyperattenuation persisting at 24 hours) and contrast enhancement (high attenuation disappearing within 24 hours).7 ICH was classified according to the European Cooperative Acute Stroke Study (ECASS) classification, subdivided into hemorrhagic infarction (HI) types 1 and 2 and parenchymal hematoma (PH) types 1 and 2.8 Infarct, symptomatic ICH, and lesion (infarct + ICH) volumes were retrospectively measured digitally via a manual region-of-interest analysis and reported (G. Ramadas, personal communication, August 2006). Vessel perforation, dissection, and subarachnoid hemorrhage were also recorded. Catheter-tip temperature was recorded for all IMS II procedures by using the EKOS sonography microcatheter and reviewed postprocedure. Temperature graphs were compared with 15-minute control angiograms to identify whether observed temperature changes correlated with recanalization. A National Institutes of Health–appointed Data and Safety Monitoring Board Committee reviewed all safety and outcome results of the IMS I and II Studies. Eighty-one subjects were entered into the IMS II trial (Fig 1). Twenty-six were treated with IV rtPA only, and 55 were treated with IV and IA rtPA. Among the 26 treated with IV-only, 2 improved clinically following IV rtPA and did not have arteriography, undergoing MR angiography (MRA) instead with no major AOL. Twelve others had no major treatable AOL at arteriography, 2 with no demonstrable AOL and 10 with distal MCA, ACA, or posterior cerebral artery occlusions not treated by the interventionist. Of these 14 with no major AOL demonstrated on angiography or MRA, mRS 0–2 was achieved in 9 (64.3%). Patient flow and treatment group designation for 81 subjects entered into IMS II. Of the remaining 12 IV-only subjects, 1 was discovered to have a high international normalized ratio and was excluded from IA treatment. One subject had coarctation of the aorta, and the ascending aorta could not be accessed in the usual retrograde transfemoral fashion for diagnostic arteriography and treatment. Three subjects were beyond the prescribed 5-hour initiation time; 2 had nonprotocol IA treatments other than rtPA, both with good outcomes. The other 7 subjects in the IV-only group had AOL eligible for IA treatment. Five had major intracranial occlusions distal to cervical ICA occlusions that could not be accessed due to inability to traverse the cervical ICA occlusions. One M2/3 occlusion was neither identified nor treated by the local treating interventionist. An early sonography microcatheter model would not traverse the distal ICA in another due to cervical and cavernous segment ICA tortuosity. MR spectroscopy 0–2 outcomes were achieved in 3 of these latter 7 (42.9%) subjects not treated by IA therapy. Fifty-five subjects were treated with both IV and IA rtPA (36 by sonography microcatheter and 19 by standard microcatheter). Thirty-five subjects had the final Primo sonography microcatheter model introduced. This catheter could not be advanced beyond tortuous segments of the ICA in 3 subjects (8.6%), who were then treated with a standard microcatheter. Three subjects were treated without sonography initiated: 2 regionally in the setting of ICA and vertebral artery dissection, respectively, and 1 when the catheter-control box interface cable connection failed. Twenty-nine subjects were treated with the Primo microcatheter with sonography activation. One of the 29 subjects had both an M2 AOL treated with the sonography microcatheter and a P2 occlusion treated with a standard microcatheter. As noted, 19 subjects were treated by standard microcatheter, including 4 in whom the sonography microcatheter advancement had been unsuccessful. In addition, there were 1 ACA and 4 M3 occlusions in which the sonography microcatheter was not indicated. One other subject had an extremely tortuous cervical ICA and the appearance of intracranial atherosclerosis, in whom the sonography microcatheter was not indicated. Four other subjects had incomplete occlusions, and IA rtPA was administered via standard microcatheter. The occlusion of 1 subject was accessed after 5 hours, and a sonography microcatheter was not introduced. The 4 other subjects had sonography-microcatheter-eligible occlusions but were treated with a standard microcatheter, according to the discretion of the operator. The primary study revascularization end point of complete recanalization of the primary AOL at 60 minutes was met in 12 of 29 (41.4%) patients with the Primo microcatheter with sonography activation. None of the 4 early sonography microcatheter models used achieved complete recanalization at 60 minutes. Complete recanalization of the primary AOL at 2 hours or by procedure end was achieved in 20/29 (68.9%) of the Primo microcatheter–treated group. Twenty-three control IMS I subjects had reliable 60-minute images for comparison of this primary end point, and 7 (30.4%) had complete recanalization (P = .41). By the end of the procedure in IMS I, 32/60 (53.3%, P = .08) patients with comparable AOLs (no M3, M4) exhibited complete recanalization (Fig 2). Recanalization in 14 patients with comparable IMS II AOL treated by standard microcatheter was compared with sonography microcatheter recanalization as well and demonstrated a cumulative 15-minute recanalization graph line that lies in close proximity to the 60-minute and 120-minute recanalization data points from the IMS I dataset (Fig 2). 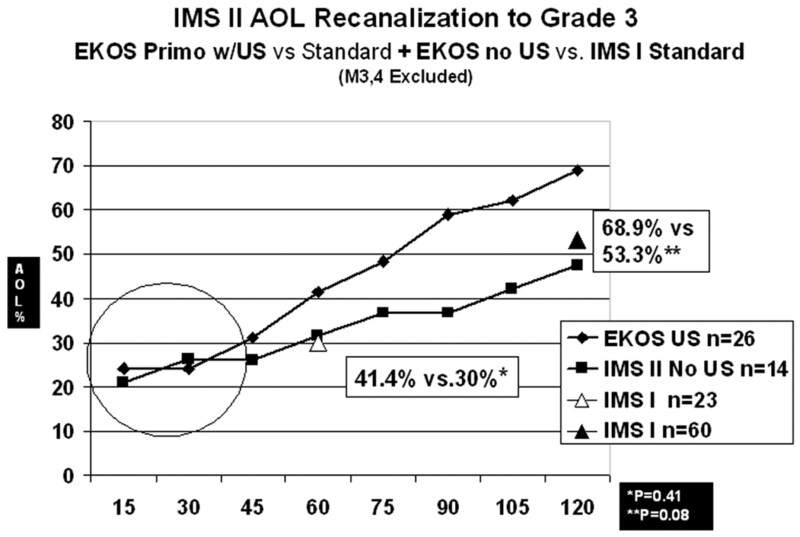 Graph depicts total cumulative complete grade 3 AOL recanalization at each 15-minute interval for the EKOS Primo sonography microcatheter (n = 29) and the standard microcatheter in IMS II (n = 14). Standard microcatheter recanalization data points at 60 and 120 minutes are also depicted. IMS I data are incomplete at 60 minutes, with 23 confirmed control arteriograms. Sixty- and 120-minute IMS I data points closely approximate the line of IMS II microcatheter recanalization. The open circle emphasizes an early equivalence of standard microcatheter to the sonography (US) microcatheter. The greatest recanalization effect (>20%) is within the first 15 minutes of microcatheter placement. Recanalization of the primary AOL leads to reperfusion into distal vessel segments. Final TICI 2/3 perfusion for the 29 Primo sonography microcatheter–treated subjects was 62.0%, compared with 56.8% for a comparable IMS I IA–treated group. No significant revascularization or outcome differences existed between IMS I and II. Sequential 15-minute control IMS II angiograms demonstrated some recanalization, however small in degree, in 69/145 (46.7%) sonography microcatheter treatment intervals, compared with 28/65 (43.1%) comparable IMS II microcatheter treatments (P = .09) and 39/111 (35.1%) comparable IMS I treatments in 23 subjects in whom reliable 15-minute angiograms were available (P = .046). Central core lab IMS II final TIMI revascularization scores demonstrated a 41% discrepancy between the core lab and the treating interventionist, with the treating interventionist usually scoring higher (better revascularization). Table 2 presents mRS 0–2 outcomes for ICA T and M1 occlusion in IMS II and I subjects combined, according to multiple target revascularization end points. These pooled data demonstrate that partial or complete recanalization (AOL 2/3) occurred in 56/75 (74.6%), and good reperfusion (TICI 2/3) occurred in 46/75 (61.3%) of ICA T and M1 occlusions. Pooled data demonstrate that revascularization correlates with good outcome for TICI 2/3 reperfusion (P = .0004), TICI 2B/3 reperfusion (P = .0002), and AOL 2/3 recanalization (P = .03) end points, compared with failure to achieve those end points, respectively. TICI 2A reperfusion correlated to better outcome than TICI 0/1 (P = .03). In addition, a trend toward better mRS 0–2 outcome was found for TICI 2B versus 2A reperfusion (P = .08). Although only 10/23 (43.5%) M2 occlusions achieved grade 3 AOL recanalization, 16/23 (69.5%) achieved mRS 0–2 outcome. Two subjects with M2 occlusions, both of whom recanalized and were discharged to home, were lost to follow-up and are included in the mRS >2 group. Comparison of the TICI 2/3 and AOL 2/3 end points as predictors of mRS 0–2 outcome shows a sensitivity of 90.5% versus 95.2% and a specificity of 52% versus 34%, respectively. Overall IMS II mortality was 16% of subjects, similar to the 16% mortality in IMS I. Of the 13 deaths, 4 were treated IV rtPA-only; 1 died secondary to symptomatic intracerebral hemorrhage (SICH) following failure to identify and treat an M2–3 occlusion. Three others died from sequelae of a large cerebral infarction: 1 of the 3 had an ICA occlusion that could not be traversed for IA therapy, a second was not treated after the 5-hour limit, and the third had coarctation of the aorta that could not be traversed for IA therapy. Of the 9 (16.3%) IV/IA deaths, 4 (44.4%) subjects did not recanalize to AOL grade 3, and 6 (66.6%) did not perfuse to TICI 2/3. Overall mortality and mortality in revascularized and nonrevascularized subjects with ICA T and M1 occlusions are further detailed in Table 2. Reduced mortality was associated with TICI 2/3 reperfusion (P = .01), TICI 2B/3 reperfusion (P = .05), and AOL 2/3 recanalization (P = .03), compared with failure to meet those revascularization end points. Mortality in subjects failing to achieve either TIMI 2/3 reperfusion or AOL 2/3 recanalization was <40% for both end points. One subject with M2 occlusion and baseline serum glucose concentrations of 400 mg/mL and creatinine concentrations of 2, who recanalized completely (AOL 3) to TICI 2B flow within 30 minutes. One subject with a nonrecanalized M1 occlusion distal to the striate arteries who experienced severe cervical ICA spasm and additional thrombus development. One subject with a nonrecanalized M1 occlusion distal to the striate arteries. One subject with a T occlusion who recanalized within 30 minutes, with an unusual pattern of cortical/subarachnoid hemorrhage following on-the-table ICH. Two subjects with recanalized M1 occlusion and angiographic evidence of pseudoaneurysm of the distal striate artery rupture following microcatheter contrast injections. Of these 6 subjects, 5 had NIHSS ≥20. Four SICHs were PH1, and 2 were PH2, based on digital volume measurement. Mean hematoma volumes in these 6 SICHs measured 23.5 mL, representing 27.9% of lesion volume, compared with 25.2 mL, or 37.1% of lesion volume, for 6 nonultrasound IMS II and IMS I SICHs. Three of the 7 SICHs had microcatheter injections. An early concern regarding a potential link between microcatheter injections and ICH with this paradigm was transmitted to investigators.9 No direct vessel perforation, primary subarachnoid hemorrhage, or intracranial dissection was documented in IA-treated subjects. Four (7.3%) reocclusions (3 complete) occurred during the procedure in 55 IA-treated IMS II subjects. New emboli in the ACA distribution were identified in 1/22 (4.5%) M1/M2 occlusions and in 1/14 (7.1%) ICA T occlusions in IMS II. Retrospective temperature analysis provided 93 IMS II data points available with both arteriographic and temperature data for retrospective analysis in the sonography-treated subjects. Temperature decreases of as little as 0.2–0.3°C could be readily identified. Forty (41.9%) temperature decreases were identified. Forty-five (48.3%) recanalizations or microcatheter retractions were identified. Temperature analysis provided 81% sensitivity, 90% specificity, 85% positive predictive value, 87% negative predictive value, and 84.9% accuracy in identifying recanalization or catheter retraction on the following arteriographic sequence. Available 24-hour CT lesion volumes demonstrated no significant differences in IMS II infarct volumes compared with IMS I subjects overall or to those treated by combined IV/IA methods. The IMS II trial was designed to study the safety and potential efficacy of a sonography microcatheter in the recanalization of acute intracranial artery occlusions in acute ischemic stroke, following reduced-dose IV rtPA therapy. Both clinical and technical factors contributed to the actual use of a sonography microcatheter in only 33 subjects. Clinical exclusions for AOL location and etiology (atherosclerotic occlusion, dissection) occurred. Technical problems (difficulty and failure in catheter passage, connector cable problem, etc) further limited sonography administration and evaluation in several subjects. Other potentially eligible subjects were excluded on the basis of clinical, angiographic, or other operator-defined exclusion factors. When used per protocol, the Primo sonography microcatheter demonstrated a trend toward achieving faster and more complete AOL recanalization compared with standard microcatheter use in IMS II, with an incomplete 60-minute dataset from IMS I and with the complete 120-minute dataset from IMS I (Fig 2), though these differences were not statistically significant. It might be unduly optimistic to expect that new revascularization methods would achieve a statistical benefit compared with a widely accepted active therapy in a small trial. Standard microcatheter use in IMS I and II allowed mechanical manipulation of thrombus, including microcatheter and microguidewire passage and drug delivery distal to the occlusion initially, as well as 15-minute guidewire/microcatheter advancement. On the other hand, sonography microcatheter use was limited to proximal bolus and drip infusion, with no guidewire manipulation beyond that required for initial and subsequent microcatheter advancement. Figure 2 suggests an early recanalization equivalency or advantage for the standard microcatheter; this potential advantage may actually be a mechanical one due to microcatheter/guidewire manipulation of favorably predisposed occlusions in the setting of IV rtPA activity. Allowing microguidewire/sonography microcatheter manipulation in a similar fashion may further enhance recanalization potential and may lead to greater in revascularization effect. Several other important observations are suggested from Fig 2. In addition to the apparent initial 15- to 30-minute equivalence of standard microcatheter use, Fig 2 also demonstrates that the initial 15-minute period actually achieves the greatest recanalization effect for both the sonography microcatheter (21%) and the standard microcatheter (24%) in IMS II overall. This also may be due to mechanical manipulation of favorably predisposed occlusions. It also demonstrates a relatively linear increase in recanalization effect with time, suggesting that failure to achieve recanalization in any time period does not predict failure in subsequent periods. In addition, the 60-minute recanalization data points of 23 IMS I subjects with reliable images and the 120-minute data points of 53 IMS I subjects with T, M1, M2, or vertebrobasilar occlusions lie in close proximity to the 15-minute line of 14 IMS II standard microcatheter cases. This suggests reproducible results in achieving complete recanalization with the standard microcatheter. Identification of 14/81 (17.2%) subjects without AOL qualifying for IA sonography microcatheter thrombolysis confirmed pre-IMS and IMS I study observations: IV rtPA may recanalize some vessels early, leading to normal findings on arteriograms (n = 2) or distal occlusions (n = 10) (Fig 1).1,10 Any comparison of recanalization rates by using IA-only revascularization methods with the combined approach in IMS I and II with studies of must take into account this early recanalization achieved after IV therapy. It is not possible to accurately compare recanalization and reperfusion results achieved with the combined IV/IA rtPA therapy paradigm with other reported IA revascularization methods in which treatment was initiated later. The 78% AOL 3 recanalization and 83.3% TICI 2/3 reperfusion of isolated M1 occlusion in IMS II, comparable with 78% for both measures in IMS I, may represent a true recanalization and reperfusion benefit compared with results obtained with r-pro-urokinase treatment in the Prolyse in Acute Cerebral Thromboembolism (PROACT II) study (67% TIMI 2/3 for M1 and M2 occlusions) and with the Multimechanical Embolus Removal in Cerebral Ischemia (MERCI) retriever in the MERCI and Multi-MERCI trials (45% and 54% TIMI 2/3, respectively).11,12 However, it still remains uncertain that revascularization end point definitions and application in the IMS studies are comparable with other revascularization studies. A relationship between both AOL and TICI revascularization end points and mRS 0–2 outcome was demonstrated for ICA T and M1 occlusion (Table 2). TICI 2/3 reperfusion better predicted good outcome than did primary AOL 2/3 recanalization. To further analyze the TICI 2 reperfusion end point in hope of identifying an acceptable or optimal stopping point for revascularization, we also categorized subjects as TICI 2A, with <50% MCA distribution reperfusion, or TICI 2B, with recanalization with flow >50% (Tables 1 and 2). TICI 2B/3 perfusion best predicted good outcome statistically (P = .0002), more robustly than TICI 2/3 (P = .0004). There was a trend for TICI 2B superiority to TICI 2A in predicting good outcome (P = .08). AOL 2/3 recanalization (partial or complete recanalization with some flow) also predicted good outcome (P = .027), suggesting that recanalization with some flow predicts good outcome nearly as well as more complete reperfusion. On the basis of these observations, safe revascularization appears to be an appropriate surrogate end point for the IV/IA treatment paradigm. It is not clear that a link between no revascularization and poor outcome is due totally to the no revascularization effect itself. Procedural factors (eg, contrast deposition, saline deposition, micro- and distal emboli, parenchymal hematoma, and even hemorrhagic transformation of injured brain) during prolonged failed revascularization procedures may contribute to the lack of good outcomes observed with this treatment paradigm. Good outcomes with M2 occlusion were not dependent on revascularization, with 13/17 IMS (76%) I and II isolated M2 subjects achieving good outcome despite incomplete recanalization and reperfusion. This likely relates in part to the much smaller volume of ischemic brain with branch occlusions as compared with occlusions of major proximal arteries. Of interest, operators scored their revascularization efforts more optimistically than the core lab. Differences between a TICI score of 2 and 3 are of questionable practical significance because these 2 scores are commonly viewed together as significant revascularization and correlate variably with increase in good outcome (Table 2). Nevertheless, it raises a legitimate question of accepting unadjudicated prospective data regarding important end points as a determinant of efficacy. In addition, this observation raises questions regarding revascularization end point terminology, definition, convention, and application. “Good” recanalization (AOL 2/3) in 46/75 (61.3%) and “good” reperfusion (TICI 2/3) in 56/75 (73.6%) of ICA T and M1 occlusions suggest that both measures are legitimate determinants of revascularization, but 12% difference confirms that they are not the same. Sonography microcatheter activity measurably increases catheter-tip temperature. Monitoring this effect as a safety measure provided a unique opportunity to examine the effect of recanalization or catheter retraction on catheter-tip temperature. Retrospective correlation of catheter-tip temperature decrease with recanalization suggests that observing tip temperature during a procedure might prospectively allow identification of recanalization between strictly prescribed angiogram intervals and, therefore, might allow the revascularization procedure to be shortened. Retrospective analysis of temperature changes was not complete for all subjects. However, where available, the correlation between a decrease in temperature and recanalization or catheter retraction from the occlusion was quite strong. Whereas some recanalization was identified in 47.6% of subjects and temperature decreases were identified in 41% of subjects, treatment time might be reduced accordingly if real-time changes in temperature decrease might be prospectively identified and acted upon (Fig 3). Temperature (T) chart correlation to recanalization in M2 occlusion. 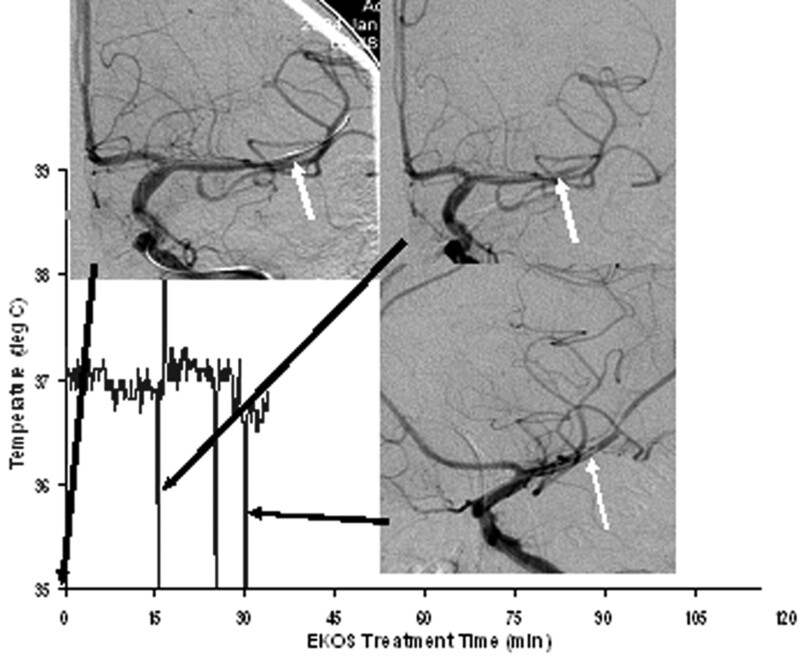 Upper left: control arteriogram demonstrates EKOS sonography microcatheter placed in the M2 occlusion (white arrow) just before treatment time 0. Upper right: 15-minute control arteriogram demonstrates microcatheter tip retraction into the M1 segment (white arrow). Note the temperature decrease of approximately 0.2°C during the 15-minute time interval, indicating cooling of the catheter by flowing blood. Lower right: oblique 30-minute arteriogram with catheter-tip position (white arrow) proximal to recanalization of the M2 segment, with distal emboli (AOL 3 recanalization, TICI 2 perfusion). Note the temperature drop of approximately 0.4°C during the 15-minute time interval. The downward spikes of T indicate cooling by contrast injection. The spike at 25 minutes was an additional injection to confirm maintenance of catheter position, where no recanalization was yet identified. deg C indicates degrees celsius. Higher ICH and contrast deposition rates with microcatheter injections suggest that technical factors may be important in clinical outcomes.9 A correlation between MCI and ICH, as well as PH, has also been found in a thrombolysis registry analysis.13 Higher ICH rates with the sonography microcatheter use were confounded by this relationship. Demonstration of rupture points of distal lenticulostriate arteries in several instances negated focal sonography or focal tissue temperature changes as responsible for these ICH cases. No single etiologic mechanism seems responsible for the observed ICH. A multifactorial contribution of rtPA, heparin, contrast deposition, and microcatheter injection pressure/volume is hypothesized. It is not unreasonable to set a target for good outcomes at 50% or greater in patients with major stroke treated with the IV/IA paradigm applied as rapidly as possible, with limited imaging selection. mRS 0–2 outcomes were achieved in 45% of IMS II overall, compared with 42% of IMS I subjects and with 39% in the treated group of the NINDS study, despite significantly quicker time to IV thrombolytic therapy in the latter. Six AOLs eligible for an IA therapy did not receive it for a variety of reasons. Subjects with M2 occlusions, with baseline NIHSS 11 and 21, were lost to follow-up but were included in the mRS >2 group. It is reasonable to expect that monitoring catheter-tip temperature may accelerate sonography-assisted thrombolysis procedures. Other further advances in revascularization with improved thrombus-removal devices, balloon angioplasty, and/or removable or implantable stents may play a part in further improving interventional outcomes. The IMS III trial, in which 900 subjects will be randomized to either full-dose IV rtPA or to a reduced-dose IV rtPA, plus IA therapy with either the Cordis Neurovascular (Cordis, Miami Lakes, Fla), Neurowave Catheter (EKOS, Bothell, Wash), Merci Retriever Device (Concentric Medical, Mountain View, Calif), or other devices that may be introduced as their approval status becomes defined, will have the opportunity to test this hypothesis. 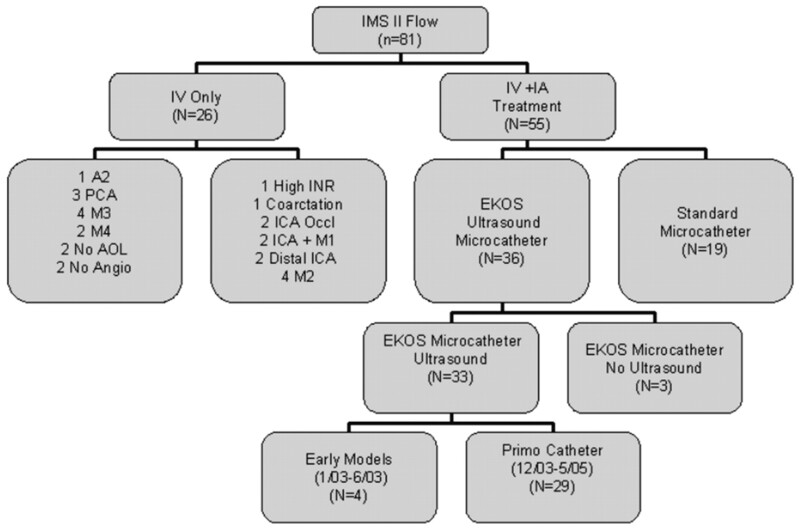 IMS II provides further evidence that the EKOS Primo sonography microcatheter demonstrates a promising trend toward improved recanalization of the AOL when compared with a standard microcatheter. A correlation between recanalization and reperfusion with outcome is again confirmed. The role of IV/IA revascularization therapy will be further tested against full-dose IV therapy alone in the IMS-III trial. This study was funded by the National Institute of Neurologic Diseases and Stroke (NINDS #NS39160) and EKOS Corp. EKOS Micro-Infusion Systems were supplied by EKOS Corp, and rtPA was supplied by Genentech Inc. Accepted after revision September 17, 2007.